[description] => A roof access hatch is designed to be a smart, robust and reliable method of allowing natural light into a room, whilst also providing access to the area above or below. Available in a range of colour tints (clear, diffused, opal and bronze) they can be made to suit customer specifications. The roof access hatch kerb offers a ribbed upper section to the external, giving improved adhesion to a variety of waterproofing systems. It is manufactured using a state-of-the-art CNC manufacturing process, which guarantees the accuracy and consistency of each unit produced. Designed to be installed at the finished roof level, the polycarbonate roof access hatch is an ideal choice for retrofitting to an existing flat roof. All of the kerbs in the range can be offered with a choice of dome or pyramid shape and are available in double or triple skin variations. The product also comes fitted with a set of gas rams that stay mounted to the internal of the kerb, assisting with the opening of the access hatch. The locking mechanism is a brighton catch; simply unscrewed to release the hatch and open out, lowering and tightening to secure. (Hasp and staple option available for use with a padlock. Please add note at checkout when purchasing). For a non-access polycarbonate rooflight, please find the rest of our range here. It is the buyer's responsibility to ensure the rooflight size purchased is suitable for the intended installation. All measurements given from the product selector are internal aperture sizes (roof opening) where applicable. [short_description] => A polycarbonate roof access hatch is a smart yet robust solution that invites natural light into a room whilst providing easy access from both above and below. With a sleek and modern design, this product is available in both dome and pyramid shapes and comes in a range of colours. A polycarbonate roof access hatch is a smart yet robust solution that invites natural light into a room whilst providing easy access from both above and below. With a sleek and modern design, this product is available in both dome and pyramid shapes and comes in a range of colours. 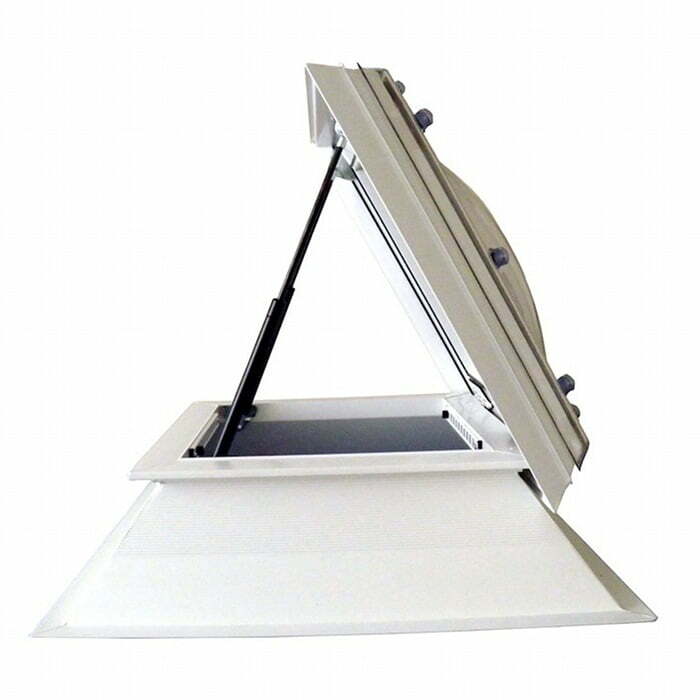 A roof access hatch is designed to be a smart, robust and reliable method of allowing natural light into a room, whilst also providing access to the area above or below. Available in a range of colour tints (clear, diffused, opal and bronze) they can be made to suit customer specifications. It is the buyer’s responsibility to ensure the rooflight size purchased is suitable for the intended installation. All measurements given from the product selector are internal aperture sizes (roof opening) where applicable.